Among activities in the cultural life of Carpathian Lemkos were raising of cattle, ewes, goats, and geese. 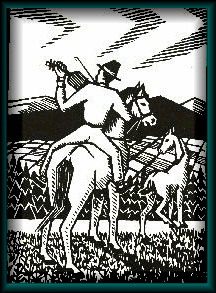 Lemko herdsman can be drawn, can be carved out of wood, he can be described as an under-age child with a twig in hands, a fellow on a horse, an old grandfather wearing a "chuha", propped up by a cane on a background of green mountains with a flock of ewes. One can draw a youth-shepherd, who plays on pan-pipe, or is carving something on a piece of wood. One could do that, because a Lemko herdsman not only was guarding the cattle entrusted to him, but also sang, picked berries or mushrooms, wove baskets out of spruce roots , for winter they prepared "smolivky"»out of those resin-rich parts of firewood, gathered medicinal herbs, and often even prepared firewood for winter heating. The old herdsmen were respected by the younger ones, who would frequently turn back their cattle for them, and those in turn would relate, by a burning "vatra", about their own and other people's live adventures. The elder experienced herdsmen rescued swollen cattle, anticipated mountain storms, and taught the younger ones, how to seek shelter from them. The elder herdsmen could treat ewe's "limping"» and "staggers", and so were called "bachas"». The most interesting was "zahvaranya kurdela"»- or cure of a difficult illness of tongue, ability that was not possessed by an average "bacha". A sick animal would stop grazing, would start losing weight right in front of your eyes, and therefore had to be slaughtered. This would be the time when "bachas" would come to the rescue. Teofil Halaburda, from the village of Biltsareva, was one of these experienced healers, who even after banishment [Operation "Wisla" - wm] was still applying his "warlock" skills to rescue the cattle. In 1950 my best cow got sick, and a hospital was about 18 km away, and to reach it during those difficult years after the war was not simple. Then I asked old Teofil to lend me a hand. He said, that this activity can only be performed just before the sunrise. He arrived before sunrise, told me to hold the cow by the horns, and himself, whispering a prayer or a curse, thrust his arm down the throat, and perhaps greased with something the sick tongue. To my utter surprise this cow started browsing grass by the early afternoon. For this service "bacha" would never accept money and would be content by a modest thank you "Bozhe vam zaplat" ["May God reward you" - wm]. These secret spells he would not disclose to anybody, except just before his death, he would pass it to his son.